This page is for WrpTool project. First we must thank a-lone-wolf (from here) for providing us with the wrp file formats, without him there would be no wrptool from us. Thank You, very much appreciated! 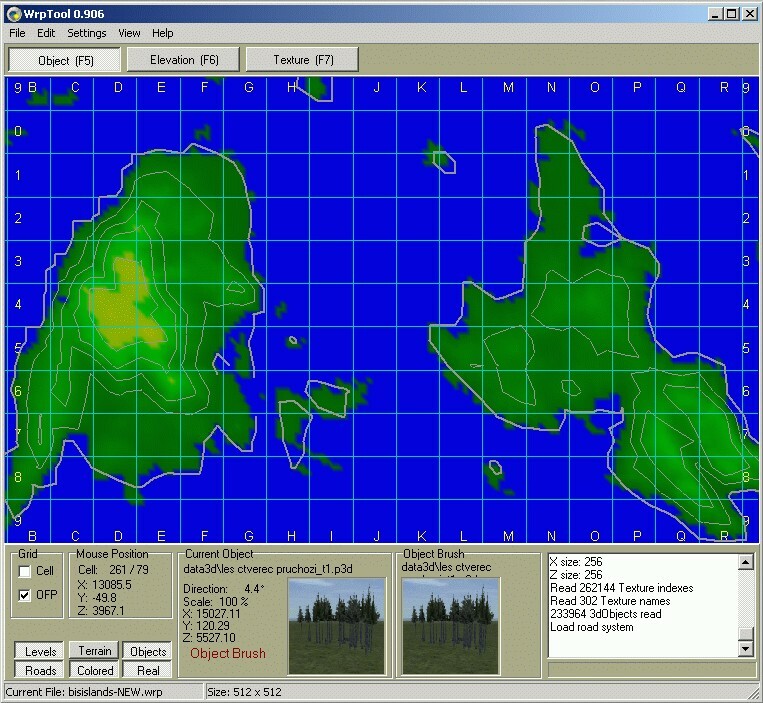 WrpTool is one util to create OFP Islands / terrains, all you need is notepad + PBO packer and you're capable of doing excellent islands. WrpTool edits all aspects of the basic terrain + objects. This project started Jan 23rd, 2003 (or bit sooner even), first real working wrp island made by us was done this day. Initial team was Rom and Snake Man, Dschulle joined in later. But with sad events regarding MLOD converter and BAS, April 2004 Rom decided to quit from the team. We will miss him. WrpTool release package comes with 124 page PDF manual which contains all the necessary information to successfully operate WrpTool and to create islands from ground up. - Feature to place terrain types. - Placer to placer different objects on different terrain types. - Templates for cities and airbases for automatic placement. - Import MicroDEM .dem format (can be done but not implemented with wilbur txt). - Bitmap drawing (ie MAP) from the terrain types and water, and objects. - Automatic road placement between two points (cities for example). How cells are set up. How forest 3d objects are set up. PMC WrpTool 2003 - 2019.